Hide unsightly messes in your kitchen garbage can with versatile Hefty Blackout kitchen trash bags. In addition to making sauces and table scraps less visible when you open the trash can, these bags partner beautifully with stainless steel (Blackout bags fit all Simplehuman Size J cans). 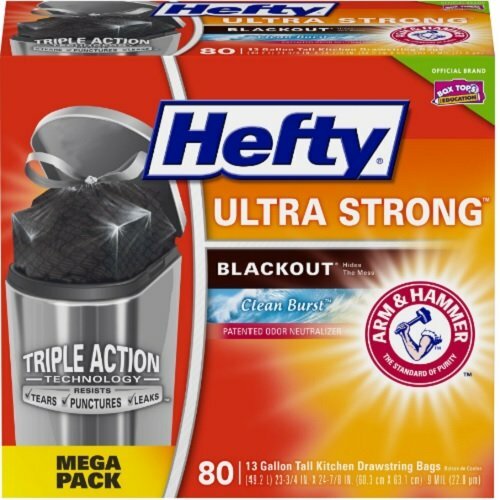 Part of the Hefty Ultra Strong family, Blackout features Triple Action Technology that allows bag to stretch so it resists tears, punctures and leaks (bag is slightly shorter when empty) and the break-resistant drawstring prevents bag from falling into can. Patented Arm & Hammer odor neutralizer fights nasty odors to keep your kitchen smelling fresh.Every package includes one Box Top to help you earn cash for your school. Package contains 80 black, 13-gallon, tall kitchen drawstring trash bags with Clean Burst scent. Hide unsightly messes in your kitchen garbage can with these versatile, black kitchen trash bags from Hefty. In addition to making sauces and table scraps less visible when you open the trash can, these bags partner beautifully with stainless steel. Part of the Hefty Ultra Strong family, Blackout features Triple Action Technology that allows bag to stretch so it resists tears, punctures and leaks and the break-resistant grip drawstring prevents bag from falling into can.